It was the final event of the BCWAS season and one of our favourite BC winemakers was the speaker. We can always count on Tinhorn Creek’s Sandra Oldfield to inspire lively discussion and offer intriguing insights into the BC wine industry. Tonight was no exception. But this time, Sandra had a special treat in store for us – a vertical flight of Oldfield’s Collection Merlot – five vintages from 2001 to 2004. Now in case you’re questioning the math of five vintages and only four years, here’s the twist. Two of our glasses actually contained the same wine, from the same barrel, bottled within an hour of each other. The difference? One was under cork, the other under Stelvin. Oh yes, and one wasn’t actually pure Merlot – it had a small amount of other varietals added. That was it, the entire sum of information we were given. Go to folks. Sip away, and do your best to figure out which year was which and what two wines were the same. Within minutes, the room was buzzing with speculation. A single sniff and Frank pegged the fifth wine as the one under cork. Across the table Leo was, quite uncharacteristically, smirking – just a wee bit. Under some “friendly pressure” from the rest of us, he finally ‘fessed up. Frank’s nose was accurate – the last wine in the flight was definitely the one under cork. He knew for sure because, as one of our dedicated volunteers, he’d poured it. However, that was the extent of our secret edge on the rest of the crowd. So now to match the fifth Merlot with its screw capped barrel mate? Most of us agreed the first in the flight was an odd man out. Different nose entirely with a hint of white pepper. The second was leather and a bit of barnyard or straw but seemed younger than the first wine and not a pair with number five. It was the third wine where conversation at our table began really heating up. Frank and a couple of others thought this was the bottle we were looking for. But when we hit number four, a few of us suggested this might be “the one.” Back and forth, we sniffed, swirled, and peered into the glasses comparing rims, depth of colour, and clarity, but by the time Sandra called a halt, our group was still undecided – like every other table apparently. In a show of hands, each wine on the table got at least some votes as the wine that was from the same barrel as wine number five which Sandra finally told us was the single vintage under cork. And the final results? Wines four and five were the pair – a 2001Merlot and the first in Canada ever to be bottled under Stelvin, even though it was only 10% of the vintage to receive this treatment. Wine three was the 2002, wine two the 2003. The first wine we tasted was the 2004 with 2% Syrah and 10% Cabernet Franc accounting for it’s unique flavour among the rest. A long time fan of Stelvin, Sandra admitted she had chosen the biggest, toughest red for Tinhorn’s initial experiments with red under an alternative to cork because “if we could make it work with the Merlot, everything else would seem so easy.” She did, however, confess to having one, growing problem with Stelvin closures. It seems her two-year-old has already figured out how to open them, thus necessitating a lock for the wine cellar back home. FYI: here are the whites we sampled earlier in the evening before the Great Merlot Challenge began. This is Tinhorn Creek’s first vintage of Pinot Gris that was partially fermented in stainless steel (40%) rather than neutral oak barrels. We both felt this wine lacked the structure we’d expected. However, it would have been worthwhile to see what happened over time as the wine opened up in the glass. Making its debut right here at our BCWAS event, this wine was 29% fermented in new French oak barrels – rather than the 20% Tinhorn normally uses – with the balance in stainless steel. Not overpoweringly oaky, but since I’m just not a fan of any oak in my Chardonnay at all, I’d probably take a pass in the liquor store. Still, it exhibits the buttery texture you’d expect and would be good with all kinds of summer picnic fare. Photo top: Tinhorn Creek’s winery. 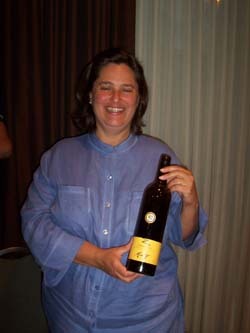 Photo middle: Sandra holding a 2001 Merlot that was the first in Canada to be bottled under screw cap. 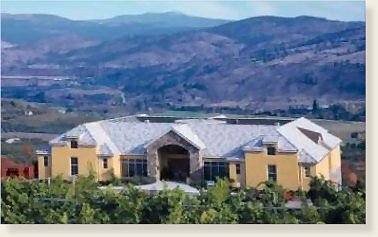 This entry was posted in BC Wines and Wineries, BCWAS, Oldfield Merlot, Stelvin, Tinhorn Creek and tagged Chardonnay, Merlot, Oak, Pinot Gris, Sauvignon blanc, Sémillon, Screw cap, Wine. Bookmark the permalink.